The Harriers players have had their short, enforced, break from football following the cancellation of the Grays game last week due to their involvement in the FA Trophy and will now be relishing the chance to pick up some points at the expense of Forest Green tomorrow. We beat another struggling side in Crawley in our last game but this game against the South Gloucestershire side from Laurie Lee country will be a harder nut to crack. They got themselves a hammering at York City last Saturday with ex Harrier Andy Bishop grabbing a hat trick in a 5-1 victory. I can't quite see us repeating that scoreline mainly because of our lack of a natural goal scorer but Andy White is the one to take that job on if only he'd move a bit more quickly. We have just the two players missing for the game. Terry Fleming sits it out after collecting five bookings and Mr Mysterious, Wayne Graves, is still out with a groin injury. FGR have just three ex Harriers left playing for them. Abdou Sall, Ryan Clarke and Matt Gadsby seem to be enjoying their football there now but Ian Foster and Jon Beswetherick have both moved on and found new clubs. Fozzie has gone to Nuneaton but Bessie has vanished into the ether and is presumably still wandering around a pitch somewhere looking lost. Byron Antony will miss the game for his club after being dismissed at York. Julian Alsop could miss out with an ankle injury and Paul Wanless has a groin strain so unless he's recovered he'll be out. 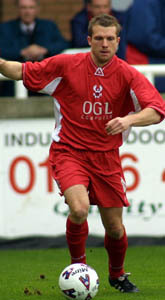 They bought back an ex player of theirs yesterday when they signed Darren Jones from Cardiff Prison on a free. I've never heard of him so I don't know what to expect. I think this will be a close game, that's if the weather doesn't get worse, and I expect us to sneak it. Only by the odd goal though. Danby, Lewis, Harkness, Burgess, Osborne, Mullins, Ludlow, Smith, Sedgemore, White, Hurren, Russell, Penn, Francis, Sheldon, Wilson, Butler, Blackwood, Thompson. Clarke, Harrison, Simpson, Searle, Gadsby, Brough, Sall, Richardson, Wanless, Jones, Rogers, Abbey, Teixeira, Garner, Alsop, Meechan, Graham, Beesley, Howell, Rendell, Stonehouse, Hayes, Madjo, Clenell, Syvestre.